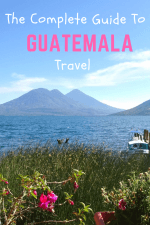 Home/Destinations/Central America/Guatemala/Guatemala Backpacking: Everything You Need To Know For An Amazing Trip! Guatemala backpacking was something we’d wanted to do for some time. The steaming jungles, incredible nature, active volcanoes and crumbling Mayan ruins were Guatemala highlights we wanted to see. There are just so many wonderful places in Guatemala. We didn’t know much about the country before we left. But we thought it looked extraordinary. And we’re thrilled we managed to visit Guatemala during our career break abroad. Planning your Guatemala trip can be overwhelming. Especially if it’s your first time in the region. Or if you haven’t done much backpacking before. You may have lots of thoughts and questions running through your head. Where should I stay? What is there to see? How can I get there? Below in our Guatemala travel blog, are all our best tips to help you get the most from your Guatemala vacation. 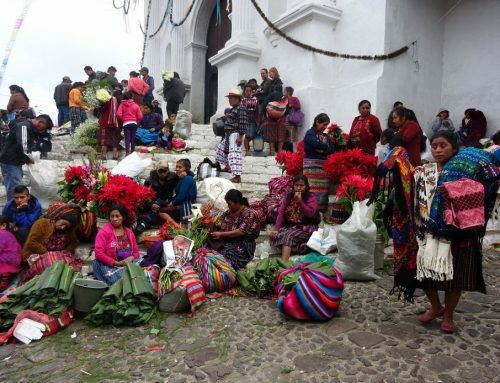 Like other countries in the region, there’s a well-trodden Guatemala backpacking itinerary. The route takes you to the most popular Guatemala tourist attractions, and the best hostels in Guatemala. You’ll find more information about that further down. Guatemala is located in Central America which is part of the North American continent. Although some people will argue this point. It shares land borders with four countries, Mexico, Belize, El Salvador and Honduras. And is bound by the Pacific Ocean in the south-west and Caribbean in the east. Many places to visit in Guatemala are located west of the capital city. Less than an hour’s drive away is the gorgeous colonial town of Antigua. The looming volcanoes that look over the town make it one of the top places to go in Guatemala. Just about everyone ends up there at some point! But backpackers consider Lago de Atitlan and its lakeside towns to be one of the best places in Guatemala. 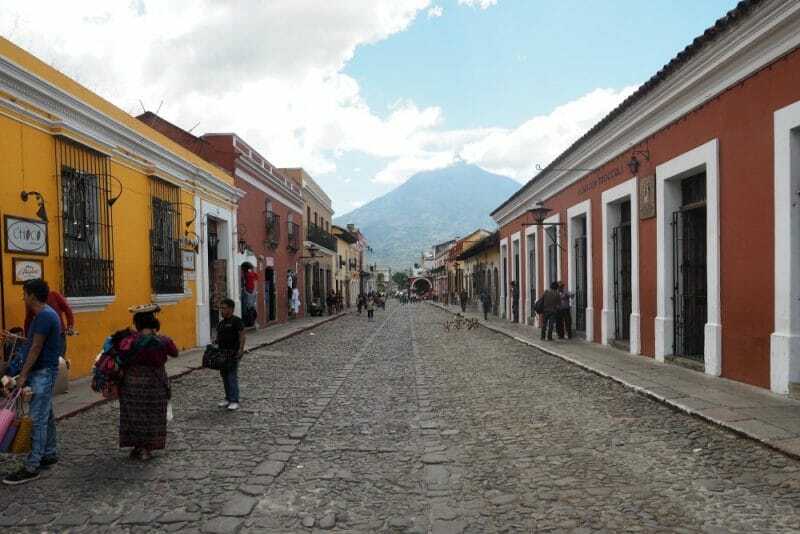 Further west Quetzaltenango, or Xela, is perfect for people looking for a Guatemala volcano hike. 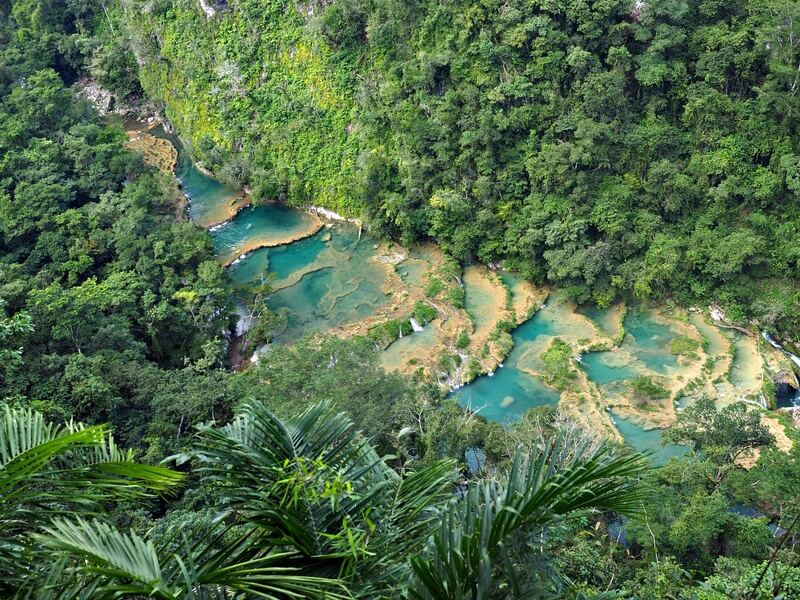 In the centre of the country are the hidden azure pools of Semuc Champey. Where you can take a dip amongst the lush Guatemalan jungle. There are ancient Mayan ruins scattered throughout the country. But the best temples and the Tikal archaeological site are located in Peten Guatemala. The towns of Livingston and El Estor on the Carribean side see fewer tourists. And is ideal for travellers looking for an off the beaten path experience. The tourist map below shows some of the best places to visit in Guatemala. Take a look and add them to your Guatemala itinerary. Unless you’re travelling overland from a neighbouring country, you’ll most likely arrive at Guatemala International Airport. Onward transport isn’t difficult and most people catch a shuttle bus either into the city or to Antigua. Taxis are also available. But like all airports, they’re a more expensive option. There are regular flights between Guatemala City and Tikal airport in northern Guatemala. Chicken buses are old school buses from North America. They are the cheapest way to get around Guatemala and cost about $US1.00 per hour. They go just about everywhere, but they tend to be slow and aren’t considered safe at night. Shuttles run along the main Guatemala backpacking route. Travellers receive door to door transport in safe air-conditioned comfort. They’re the most common and easiest way to travel Guatemala. 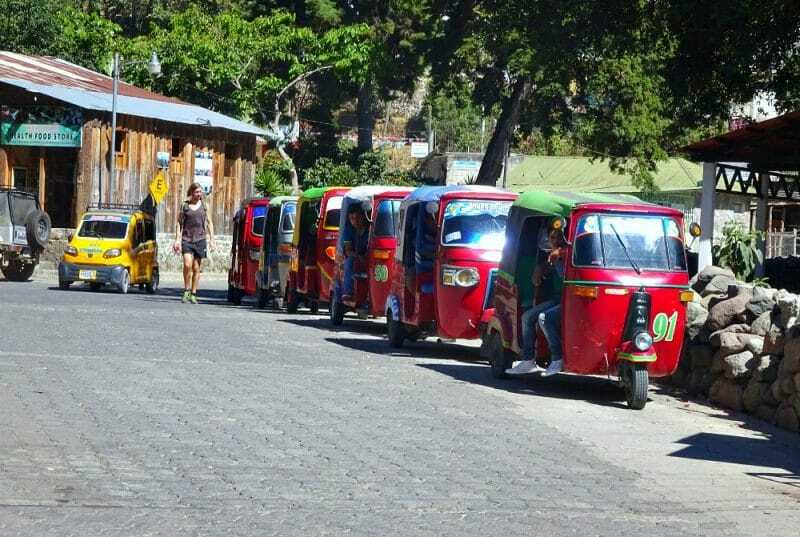 Do you know there are tuk-tuks in Guatemala? We didn’t and we were surprised to see them zipping about. You’ll find them in small towns across the country. Although they aren’t as plentiful as in South East Asia they’re still a cheap and convenient way to get around. Most travellers to Guatemala don’t need a tourist visa for stays of up to ninety days. All you need is a passport valid for the next six months with a blank visa page. Guatemala doesn’t have entrance or exit fees. The Guatemala currency is the Guatemalan Quetzal. You can withdraw up to GTQ2000 at a time But expect a high withdrawal fee for international bank cards. Some machines can be picky about which cards they accept. Our Australian travel card was only accepted by one bank’s teller machine. We often had to look around to find the right one. 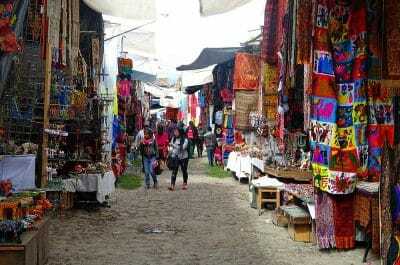 Supermarkets, hotels and Guatemala tours charge an extra fee if you pay by card. Chicken buses, small bakeries, food stalls and outdoor markets only accept cash. It’s a good idea to inform your bank and credit card company of your travel plans. Otherwise, they might put a hold on your card due to unusual activity. Arrrgh!! For safety reasons, it’s best to try and use an ATM inside a bank. Teller machines often empty out before holidays and weekends so withdraw your money beforehand. Is Guatemala safe to travel? and Is it safe to travel to Guatemala? Let’s be honest here you can’t muck around when it comes to safety. So if you’re heading to Guatemala please check your government’s Guatemala travel advisory first. We aren’t experts on this issue but if you were to ask us how safe is Guatemala? We’d say you need to take care and use your common sense. 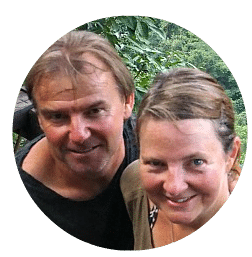 We heard many stories from other travellers about Guatemala travel safety. They were stories that can’t be verified and they got bigger and more frightening with each telling. But the truth is, most visitors to the Guatemala area have a wonderful time and bad things happen everywhere. The most important thing you can do is protect yourself and your belongings with travel insurance. We use World Nomads for all our travels. Now that’s out of the way let’s get to the fun stuff! Here are 8 travel tips to help you decide what to do in Guatemala. Visit Tikal Guatemala: The Tikal Archaeological Site is one of the best things to do in Flores Guatemala. Take a yoga class: There are tons of yoga classes available at San Marcos La Laguna. They even have long-term yoga and meditation retreats. Go surfing: Guatemala’s coastline is full of uncrowded good quality beach breaks. Learn Spanish: One of the top things to do in Guatemala is to have Spanish lessons. They’re cheap, and Spanish classes are available all over the country. We’ve heard good things about Maximo Nivel and think it’s worthwhile checking them out. Check out a cemetery: Sounds weird, right? But there’s something wonderfully macabre about visiting a cemetery. And Guatemala has some of the most colourful cemeteries in the world. Explore Guatemala historical sites: Guatemala points of interest include an abundance of colonial churches, monasteries, spectacular ruins and Spanish Baroque influences. In our opinion they’re all a Guatemala must see. Hiking Guatemala Mountains: People come from all over the world to go hiking in Guatemala. Climb to the top of a volcano: If you enjoy trekking Guatemala mountains, why not a volcano too? Guatemala has over thirty volcanoes. This means you have plenty of options to climb one. 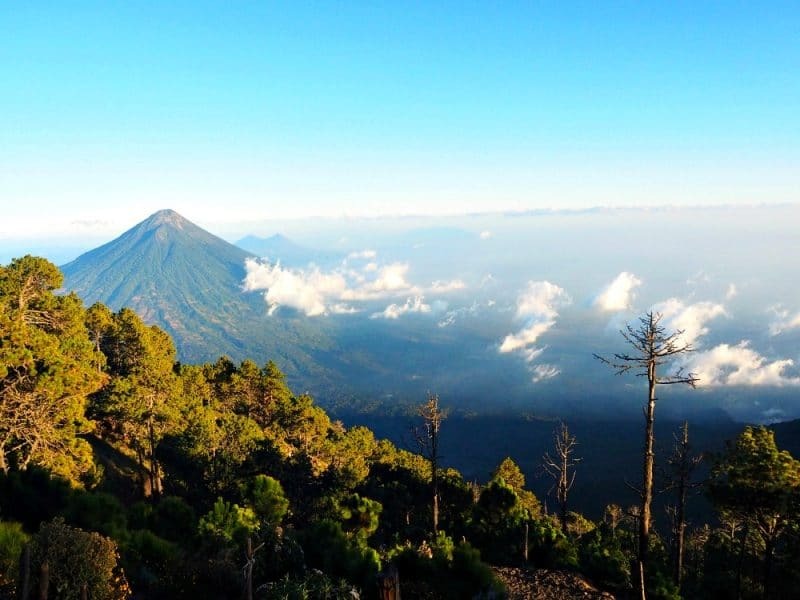 Try climbing the highest volcano in Central America – Tajumulco. Take a look at this stunning Guatemala video. It’s spellbinding! There are better-known places to see in Guatemala than its beaches. With luscious jungles, smoking volcanoes, colonial cities and ancient Mayan ruins, they have some stiff competition! But if you’re wondering what to see in Guatemala. Then you might want to consider a trip to the beach. There are great beaches in the Guatemala region on both the Pacific and Caribbean coasts. That boast both white and black sand. Add them to your Guatemala travel itinerary and you’ll get to enjoy pristine stretches of uncluttered coastline. The Pacific coast is famous for its black sand, beautiful scenery and surfing. It’s the most easily accessible from the more populated areas. But the water is strong so take care when swimming. Guatemala’s location allows for a small stretch of Caribbean coastline between Belize and Honduras. It’s where you’ll find more traditional white sand beaches. However, the area can be difficult to get to and some beaches are only accessible by boat. Here are some of the best places to stay in Guatemala. El Hostal: A chilled hostel with hot showers. That’s housed in a colonial building in a great location. Super helpful staff and free breakfast. For more information and the latest prices for El Hostal click here. Hotel Casa Cristina: Amazing location. It’s one block over from the main square so you can walk everywhere. The rooftop has breathtaking views of the city and volcanos. For more information and the latest prices for Hotel Casa Cristina click here. La Iguana Perdida: Perfect spot to chill out for a few days, with wonderful views of the lake. It’s a very quiet town and there’s very little partying. For more information and the latest prices on La Iguana Perdida click here. Mr Mullet’s Hostel: Good breakfast, friendly staff in an excellent location. There’s a communal area with a social atmosphere. For more information and the latest prices for Mr Mullet’s Hostel click here. Hospedaje El Viajero: Nice guesthouse with a lovely courtyard and garden. It’s just a short walk to the shores of Lake Atitlan. Take a stroll and watch the sunrise over the lake and volcano. For more information and the latest prices for Hospedaje El Viajero click here. Hotel Casona de La Isla: With its lakeside location on Isla de Flores, sunset views from the bar and excellent pool, you can’t go wrong. For more information and the latest prices for Casona de La Isla click here. Tikal Inn: Fantastic location only a ten-minute walk to the ruins. It offers rooms, suites, and villas at various prices and you can choose from either pool or jungle views. For more information and the latest prices for the Tikal Inn click here. Hostal Oasis: Beautifully located by the river amongst lush greenery. You can go tubing along the river right in front of the hostel. For more information and the latest prices for Hostal Oasis click here. Hotel Kangaroo: An all wooden secluded hostel by the river with hot showers, Wifi and a fully stocked bar. What else could you want? For more information and the latest prices for Hotel Kangaroo click here. The Black Cat: Good central location in a cosy quiet street. People rave about the huge free breakfast. For more information and the latest prices for The Black Cat click here. There are so many wonderful Guatemala places to visit, it’s almost impossible to see them all. But you can have fun trying! To help you out we’ve made a list of the top Guatemala tourist places. Nestled deep in the jungle the magnificent ruins of Tikal are worth a Guatemala trip on their own. Arguably the most impressive Mayan ruins in Central America they’re in remarkable condition. And they’re easily one of the top places to visit in Guatemala. It’s a huge Mayan site that’s a testament to the cultured heights of the ancient civilisation. And with its roaring Howler Monkeys, buzzing insects and luscious green jungle, exploring the Tikal ruins is a Guatemala adventure. 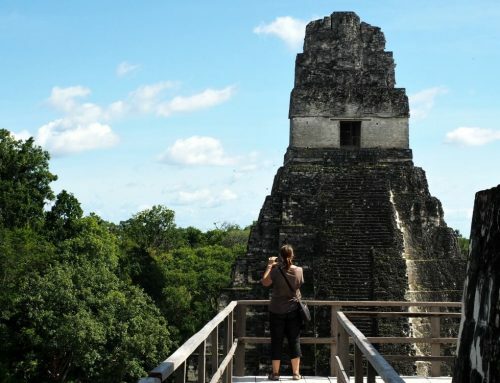 Consider joining one of the many Tikal Guatemala tours to get the most out of your time at the site. This cascading series of beautiful azure pools in the middle of the jungle will take your breath away. And it won’t be because of the steep climb to get there. Alright, the climb will leave you out of breath but Semuc Champey is stunning! It’s a full day of travel along windy roads to get there. But you’ll be well rewarded for your efforts. And it’s one of the top Guatemala destinations everyone must visit. Tours can be arranged at any hostel in Lanquin and are the best (and most fun) way to see the pools. But they’re not for the faint-hearted. The day starts with a forty minute drive standing in the back of a pickup truck. From there it’s a hike to a look-out point, swimming in the pools, cave exploration and ends with river tubing. Quetzaltenango, or Xela, attracts backpackers who want an authentic experience away from the Guatemala tourist spots. People tend to stay longer here to attend Spanish school or help out by volunteering. Xela is also a great place to base yourself for hiking in the western highlands of Guatemala. Its cobblestone streets, colourful buildings and stunning volcano views will charm the most hardened traveller. And it’s where you’ll find one of the most well-known Guatemala landmarks – the Santa Catalina Arch. The city has everything a backpacker needs: quality restaurants and bars, (check out the Londoner Pub), Guatemala travel packages, local shopping and best of all – great coffee. P.S. Antigua is listed as a UNESCO World Heritage Site. Located on the caribbean coast, Livingston is quite unlike anywhere else in the country. Here you will find a mix of Garufina, Maya and Afro-Caribbean people who create a unique city unlike any other. It isn’t easy to get to though, the only access to the town is by boat. But once you’re there you can explore the Rio Dulce canyon, go kayaking, visit villages and walk in the jungle. Or else you might choose to just eat the local food and chill in a hammock. 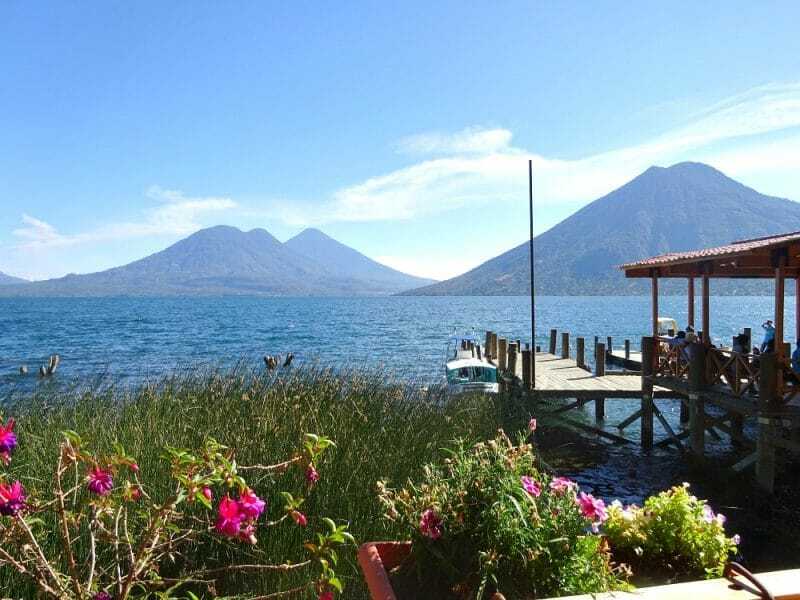 Lake Atitlan is said to be one of the most beautiful lakes in the world. And when you see the humongous aquamarine lake sparkling in the sunshine you can hardly disagree. Mayan villages dot the shoreline and the surrounding volcanoes bathe the entire area with a mysterious beauty. Each of the villages caters to a different type of traveller, from party animals to hippies to introverts and expats. There’s a village suitable for everyone. But don’t just visit one village, make sure you check them all out. 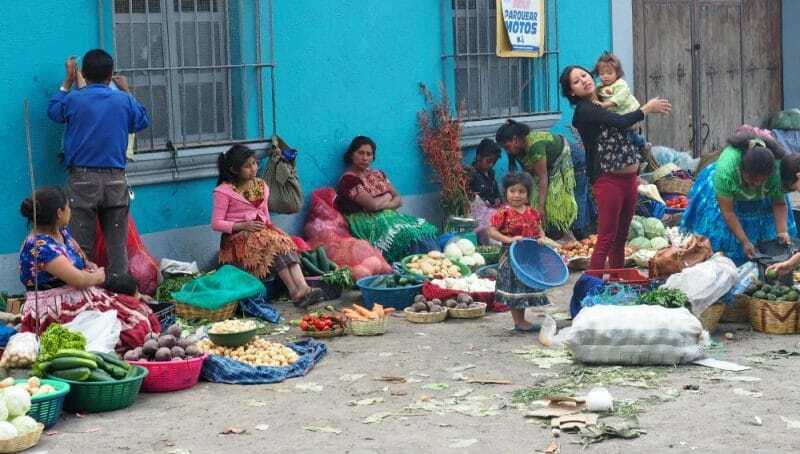 Chichicastenango’s main drawcard is its famous market. Held every Thursday and Sunday it’s said to be the largest in Central America. 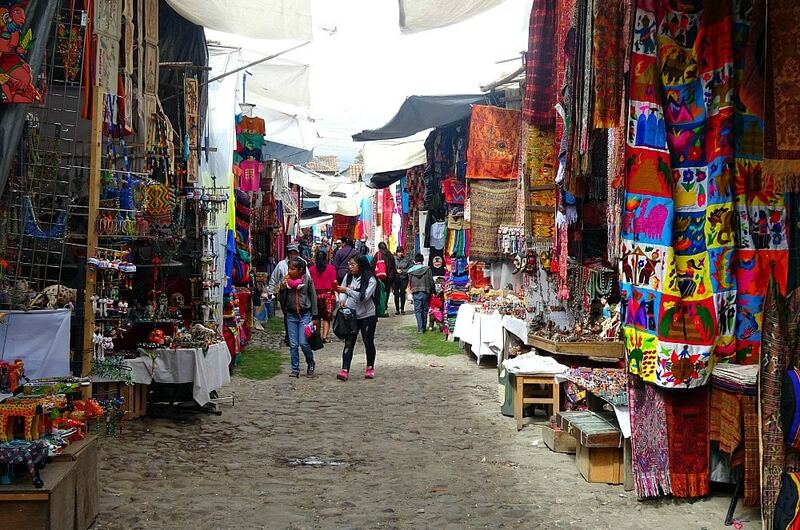 Locals come from throughout the countryside to sell traditional handicrafts, fresh produce, clothes and stunning textiles. This vibrant and bustling market is a fun day out even if you’re like us and aren’t into shopping. And while you’re in Chi Chi take a peek at the colourful cemetery. 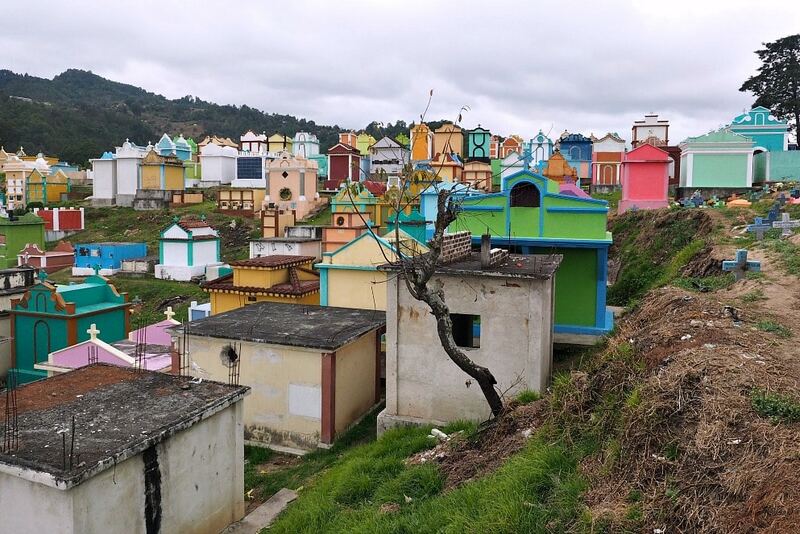 The brightly painted mausoleums, stacked graves and caskets give it an almost happy feel. The incredible views from Volcano Acatenango are unlike anywhere else. Its neighbour de Fuego is one of the world’s most consistently erupting volcanoes. And it’s this volcano’s high altitude fireworks show that trekkers come to see. But be warned, many people claim it’s one of the most physically and mentally challenging things they’ve ever done. You really need to be fit to do this. Top Tip: If you don’t fancy a two day 4000 metre volcano trek. Then you might prefer trekking Volcano Pacaya. You get all the thrills of a volcano hike in one day – and you even get to toast marshmallows! Here are some interesting facts about Guatemala. It’s where blue denim comes from. Guatemalans fly kites to honour the dead. Every year on November 1st Guatemalans clean and decorate the graves of loved ones. Then they fly intricately decorated kites high in the sky. Guatemala is a mass producer and exporter of chocolate products. At 4,500 metres, Guatemala’s Volcano Tajumulco is Central America’s highest peak. It has over 30 volcanoes, three of which are active – Fuego, Pacaya and Santiaguito. There’s a legend that says Mayan babies don’t cry because they’re all born warriors. Coffee is Guatemala’s biggest export business. The coffee has a distinctive full-bodied flavour with rich chocolate and cocoa undertones. Quetzaltenango and the Guatemala currency the “quetzal” are named after the beautiful endangered bird. 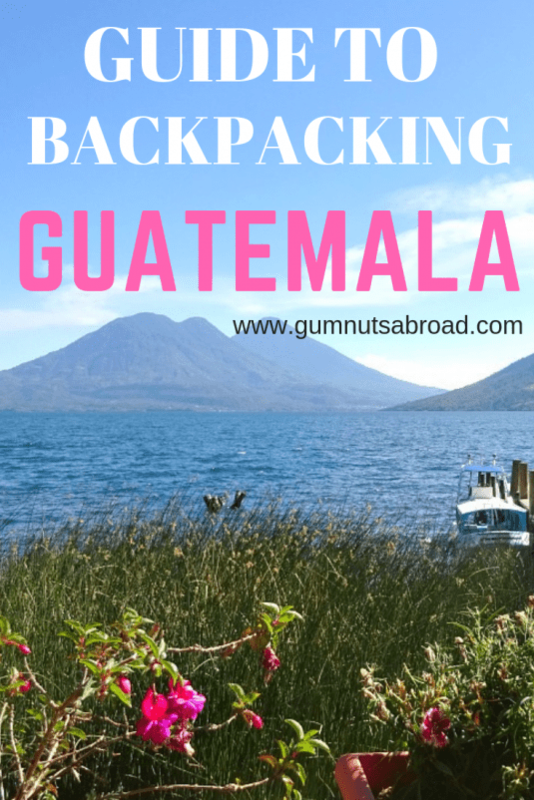 Guatemala is an affordable backpacking destination. But if you’re on a budget it’s a good idea to follow a few tips. Avoid the fancy Guatemala hotels and stay in cheap backpacker hostels instead. Eat at local comedors – think beans, rice and corn tortillas – rather than upmarket restaurants. Food at Guatemala tourist sites can be costly so take your own snacks. And if you really want to save a few bucks, don’t travel on shuttle buses. Use chicken buses instead. Don’t drink alcohol. That stuffs expensive! ∗ All prices are in United States dollars. Food: Mid-range restaurant $12.00. Local comedor $4.00-$5.00. Street food (pupusas) $2.00. Tourist sites: The more famous the site the more expensive it is. $8.00 – $20.00. Shopping: Supermarket items cost the same as at home. What is the best time to travel to Guatemala? The best time to visit Guatemala is in the dry season – December to May. The cheapest time to visit is the wet season – June to November. But dodging rain showers around temple ruins isn’t fun. The Guatemala weather can be chilly in January and February, especially at elevation. Sometimes it even snows! For more in-depth Guatemala information, we recommend using a guidebook. And you can get them on Kindle if you don’t want to lug a book around. We hope this guide helps you to enjoy the best of Guatemala. Firstly I would like to thank you for sharing your views on Guatemala Backpacking: Everything You Need To Know For An Amazing Trip!. I was looking for the same blog. Please post some more blogs related to ” Most comfortable hotels in Guatemala” so that every visitor could plan their trip & find easily the best hotel to make their vacations memorable. Thanks for reading our blog post I’m glad you liked it. We’ll be sure to include some accommodation in the future. Audrey, this post is very helpful in planning a trip to Guatemala. It will make travel a lot more easier. Glad you found it useful Lydia.